I chose this book because I heard somewhere that it was about ice apocalypse. In snowless England I wanted to read something to make me grateful for a mild climate (which I’m otherwise not that happy with). So yes, this book did make me appreciate a mild climate and also the fact I don’t do drugs (generally). I am yet to read a book which was published in the 60s and wasn’t completely bonkers. Our generation seems so tame and conservative in comparison. I can’t imagine contemporary big publishers taking a chance on something that makes so little obvious sense. The great thing about Ice is that you can have fun with it. I mean you can interpret it in a million ways – not sure if it is your idea of fun but for me it is. On the surface it’s a story of an unnamed narrator searching for unnamed girl while fighting another unnamed man for her affection (why name your characters? That’s sooo 1950s.) And all of this while the planet is facing the apocalypse and ice is threatening to swallow everything. The reader follows this frustrating chase which makes less and less sense and it feels like one of those unnerving dreams. One of the first interpretations that came to my mind was that of the Cold War. The brutal reality of that world, military governments, ice plus the fact the book was written in the 60s all seem to fit nicely with this theory. But why stop there? Anna Kavan was a heroin addict and you will have no trouble with seeing the whole book as an allegory of addiction. Let’s remove the book from its author and its time. Then really – the sky is the limit. I think my favourite interpretation is that of a power struggle in a relationship. This whole ‘I can’t love you without possessing you’ conundrum. The whole you are the OBJECT (of my affection). Both men in the book are actually one man trying to disown the part of his personality he is not comfortable with. All in all, it’s a typical 60s book. You finish the last page, close it and ask yourself: what the hell did I just read? And yet, you keep thinking about it. Every now and then something reminds you of this book. 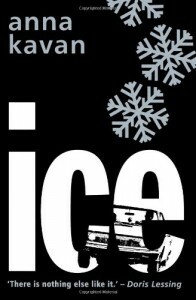 Some time later you are reorganizing your bookshelves, or maybe just looking for that book you were sure you had but instead you come across Ice. You open it at random and start reading it again.